Dinner is a Snap When You Use Your Crock Pot! Busy night? If you are like most families, just being able to sit down at the table is a huge task, trying to get something made and on the table is close to impossible. Sometimes we are too tired to think about dinner. Or the mess. We just need to have it ready for us and with this recipe it can. Literally this gets made up and put on for 3 to 4 hours and it is hot and ready. You can actually go ahead and load up your crock-pot the night before so in the morning all you have to do is turn it on. I am thinking this would be a great lunch for a Sunday afternoon, or top take to a potluck. And served with a salad and crusty Sourdough bread I can’t imagine anything better. I know it seems like a lot of food in this recipe so feel free to cut it in half if you need to, or plan to take a serving to someone who could use a little TLC. Heaven knows I need it every once in a while and others do as well. the other day I took a small meal to someone whose husband had been sick. She was so grateful and it was really not a bother at all. 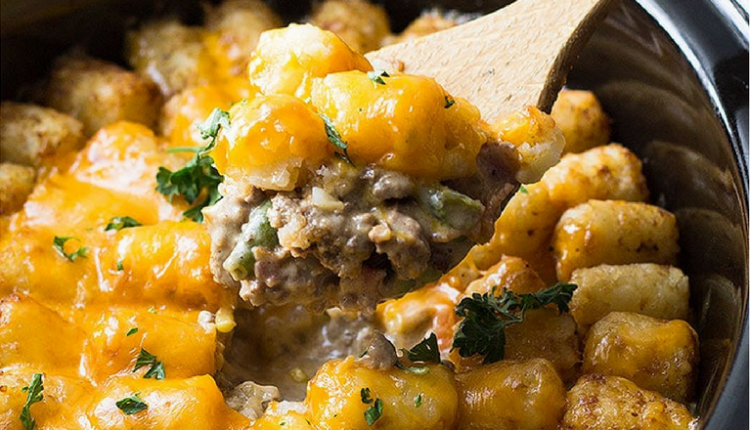 A little tater tot love can go a long way that’s for sure. Here is what Julie has to say about her inspiring recipe. When I am going to be having a busy night I like to use the help from my crock pot. And when life gets crazy I tend to crave comfort food. Quick Tip: If you would like to substitute in your favorite cream soup just omit the flour, milk, Worcestershire, and sour cream. If you are making the full amount add in 2 cans. Photo and recipe courtesy of Julie of Julies Eats and Treats. WHY WOULD ANYBODY GO TO THE TIME OF COOKING ALL THE INGREDIENTS AND THEN PUT IT IN THE CROCKPOT FOR 3 1/2 HRS, WHEN YOU CAN BAKE IT FOR 35-40 MINS? DUH!!! I love being able to cook things up if they cook at different times and temperatures and then if it is a big gathering, I will put the dish in a crock pot to keep it warm or allow to simmer while company arrives so we don’t have to worry about dinner getting cold. But that is just my preference. If someone goes back for seconds it is nice that it is still just as hot as their first serving.